The Serb List will leave the Kosovo government, and then early next month start forming the Community of Serb Municipalities (ZSO) on its own. The formation of the ZSO is an obligation undertaken by the authorities in Pristina under the 2013 Brussels agreement, but it has not yet been fulfilled. The announcement today was made by Goran Rakic, after representatives of the Serb List held a meeting in Belgrade with President Aleksandar Vucic, and Director of the Government Office for Kosovo and Metohija Marko Djuric. Earlier in the day, reports said that the night and the morning went peacefully in Kosovska Mitrovica, whered the situation was described as calm, but still tense after yesterday’s incidents. Also, the Serbs set up a blockage on the main road Pristina-Raska road, while about 50 trucks are stuck at the Jarinje administrative line crossing. According to reports, members of special police forces, known as ROSU, were present this morning on the streets, but in the southern part of Kosovska Mitrovica. Marko Djuric was arrested yesterday in Kosovska Mitrovica, where he attended a gathering on the internal dialogue on Kosovo, and then taken to Pristina, before being turned over to Serbian authorities. 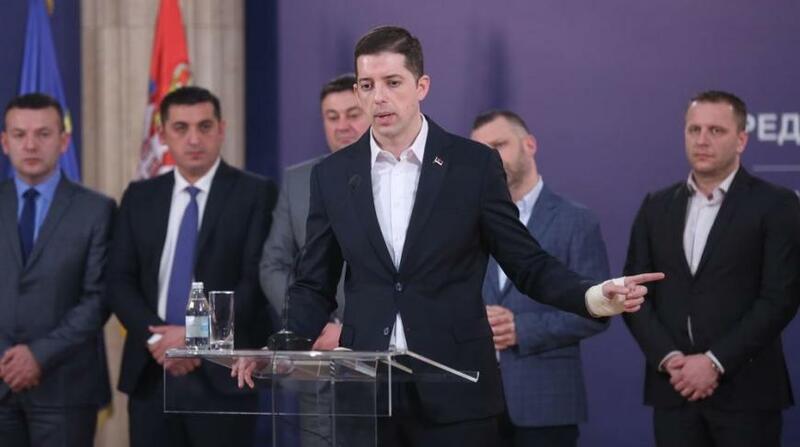 “Albanian separatists tried yesterday to occupy Kosovo’s North in a brutal way, using violence and terror,” Marko Djuric said on Tuesday in Belgrade. Djuric also described members of Kosovo police as “an armed falange” rather than official persons, and stressed that he was “dragged like a dog” as attempts were made to humiliate him, Serbia, and the Serb nation. “They put me in a transporter (vehicle), struck me, attempted to intimidate me, pushed a rifle against my stomach, one of them took out a knife, they took selfies. On the way to Pristina (from Kosovska Mitrovica) they chanted ‘Allahu Akbar’,” Djuric recounted his ordeal, adding that although he is experiencing pain, he feels good. “If there weren’t for one call from Belgrade, the violence and the terror against the Serbs would have continued,” the official said, but would not reveal what call he had in mind. The Serbian president then urgently called the Council for National Security, which was originally scheduled to meet on Tuesday. In Kosovska Mitrovica, it was extremely tense after Djuric’s arrest, sirens were heard in the city, and citizens were upset by the brutal arrest.